CINCINNATI--(BUSINESS WIRE)--For too long, consumers have believed that the only way to truly get their dishes immaculately clean is to wash them before they go into the dishwasher and then inspect them and re-wash them once they come out. In doing so, they’ve taken the dishwasher’s job away from it, and made a lot of work for themselves. Similar to a helicopter parent, these Helicopter Cleaners hover and swarm, lacking the confidence their dishwasher can succeed on its own. To reassure Helicopter Cleaners, Cascade is launching a new and improved Cascade Platinum formula, packing the most concentrated cleaning power in every ActionPac. The new ActionPacs unleash three different cleaning agents to dissolve food, lift it off and rinse it away. With the resulting immaculate clean, Helicopter Cleaners can let go of their time-consuming dishwashing habits. 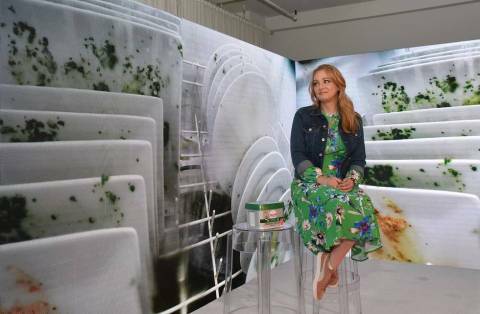 Cascade partnered with Wendi McLendon-Covey in New York City on April 24 to reinforce how to break the cycle of being a Helicopter Cleaner with the help of some tough love “therapy” sessions. Guests were able to see the actual inside of a dishwasher via “dish cams” to see how Cascade Platinum works to produce sparkling clean dishes—without the hovering. Cascade Platinum Dishwasher Detergent and Cascade Platinum Dishwasher Cleaner have both been named Product of the Year winners for 2018. Cascade Platinum and Cascade Platinum Dishwasher Cleaner have received top honors in the Dish Care category of the world’s largest consumer-voted award for product innovation. Winners are backed by the votes of 40,000 consumers in a national representative survey conducted by research partner Kantar TNS, a global leader in consumer insights. Consumers can join in on conversations using hashtag #CascadePlatinum and by following Cascade on Facebook and Twitter. Cascade Platinum is available at mass merchandise outlets, grocery retailers, home improvement stores and e-retail sites throughout the U.S. Try it risk-free today. For more information on the Cascade family of products and to post Cascade Platinum product reviews, visit www.cascadeclean.com. In 1953, Cascade entered the automatic dishwashing market with claims of “spotless dishes” to the four percent of households with dishwashers. The fast-moving world of household innovations was just in its beginning stages, and Cascade stayed at the forefront for the next 50 years by developing a range of automatic dishwashing products perfect for a variety of families, needs, and lifestyles. Today, with decades of experience and dishwashers in more than 60-percent of households, Cascade continues to grow, striving for immaculate dishes every time with its brilliant automatic dishwashing powders, gels, pacs, and additives.